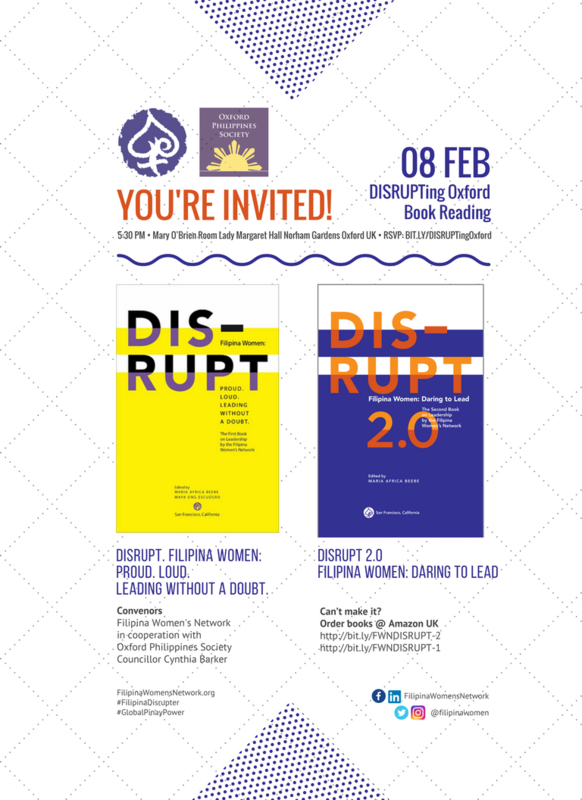 In Celebration of Global Pinay Power, Filipina Women’s Network (FWN) in cooperation with the Oxford Philippines Society and Councillor Cynthia Barker, please join us for a lively book reading and find out how Filipina Women Are DISRUPTing The World. "Filipina women are the ultimate global disrupters. They disrupted their lives—families and careers—when they left their home country to immigrate to foreign lands and re-invent their lives. They disrupted their organizations as they became achievers in their professional fields and broke "glass ceilings". They disrupted the business landscape when they innovated products, improved or created services that impacted the lives of women and the citizenry. They disrupted their communities as they became strong advocates for social issues that affected their families especially their children. They disrupted the political world when they ran for elected office representing causes benefiting local communities. They became political insiders as valued advisors of the elected officials they work for. Second generation leaders who were raised in bi-cultural or multi-cultural families are the true disrupters. Growing up confused they learned to embrace eastern and western values and traditions. They challenged themselves by defining their new identities as they navigated their way in their schools and the workplace. They developed new paradigms to managing conflict and broke antiquated rules to spark thoughtful conversations that the 21st century is about embracing all things multi-cultural. Filipina women do not back down—once they make up their minds that they will get behind a cause or an issue that will change how we live or aim for that promotion or leadership position—they don't stop. They're tenacious. They're firm. They're forceful. And they don't give up. We are the Filipina Disrupters. Are you?" Excerpt from “DISRUPT. Filipina Women: Proud. Loud. Leading Without A Doubt." Limited seating. Register now at bit.ly/DISRUPTingOxford!